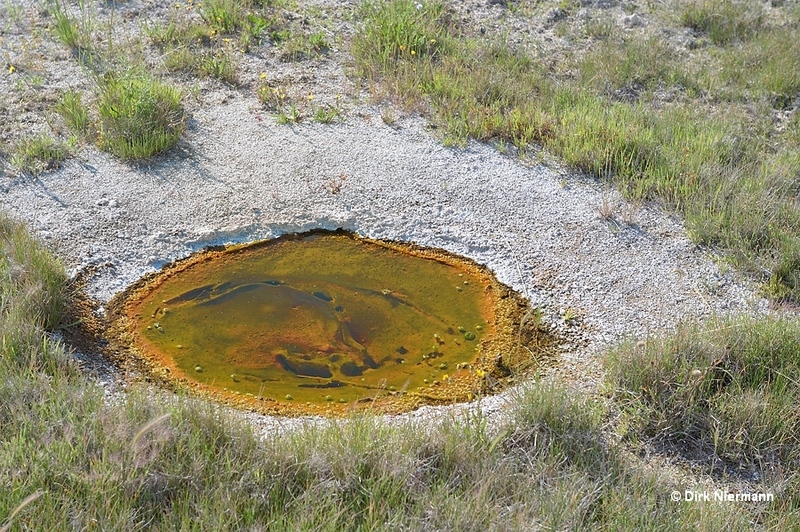 Across the boardwalk from Sponge Geyser a closer look into an inconspicuous little dark hole reveals stunning, claw-shaped sinter formations on its walls. 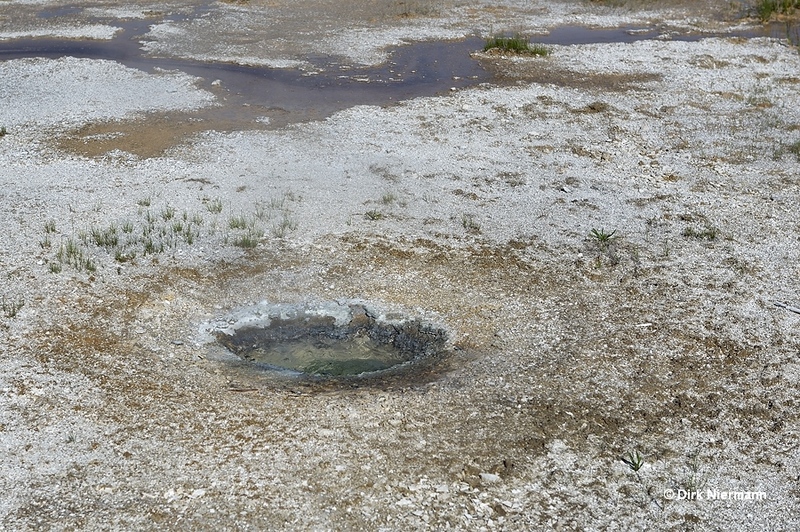 In the past the bowl contained hot water, but drained suddenly in 1931 and acted as a weak steam vent ever since. Topaz Spring is named with respect to its colors, however, the colors of the gemstone range from golden or red brown to yellow, and natural blue varieties are also known. So the true color of the spring before 1931 is unclear, but the current intensely red brown would also fit into the color range of topaz. 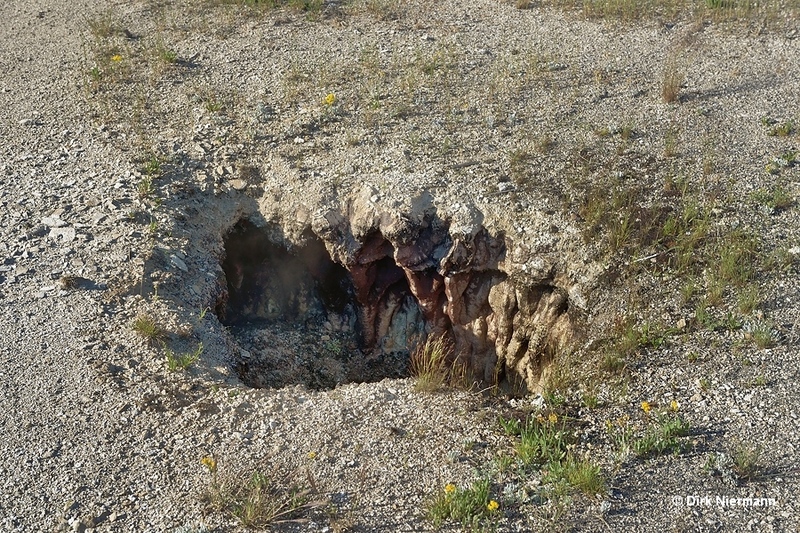 In August 2017 the bottom of Topaz Spring caved in and a large cavernous opening below the spring became visible. 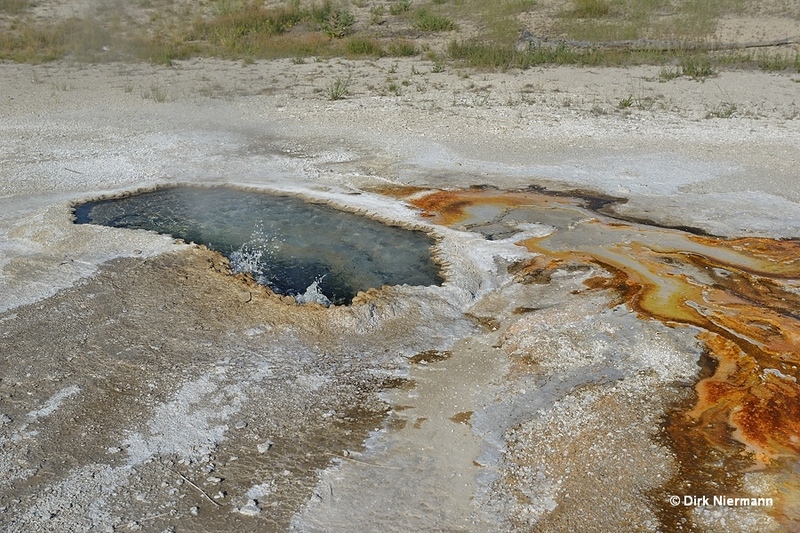 There is some hot water present in the deep, surprisingly well below the water level of nearby Pump Geyser. It may be interesting to see how Topaz Spring will develop in future. A short distance down the boardwalk the almost continuous eruptions of Pump Geyser can be observed. 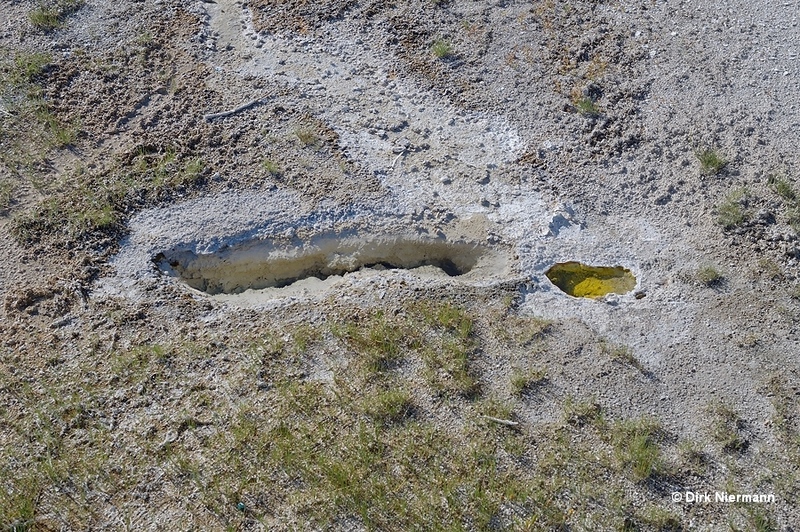 In the runoff area of Pump Geyser an unnamed tiny spouter shows up. 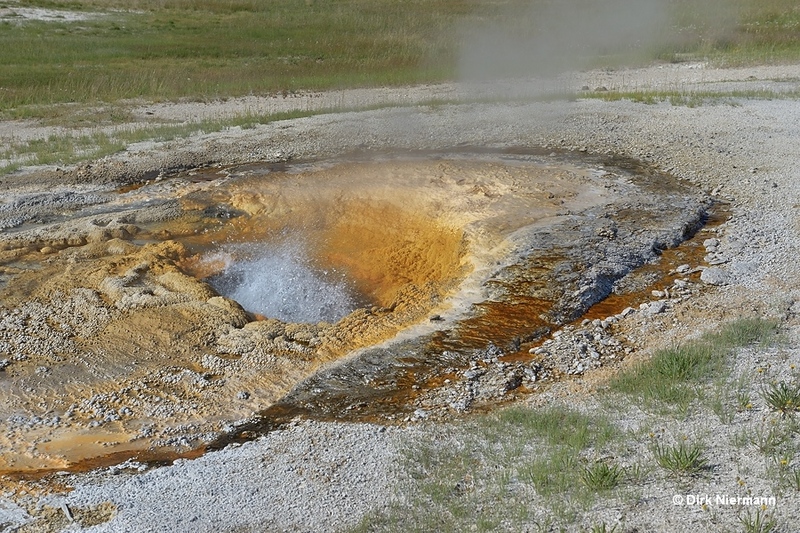 In 2018, overnight between September 18th and 19th and shortly after Ear Spring erupted, a new vent developed in the area west of Pump Geyser and north of Sponge Geyser. Meanwhile the surrounding ground showed "breathing", a rising and falling by about 15 cm (6 in) every 10 minutes. 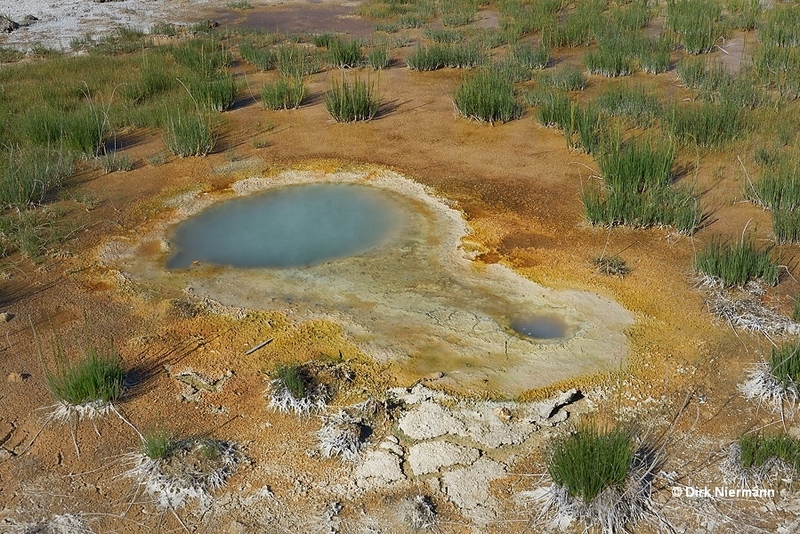 Farther north Doublet Pool displays both fanciful sinter structures and stunning colors. As an intermittent spring the water level changes around several inches within half an hour. 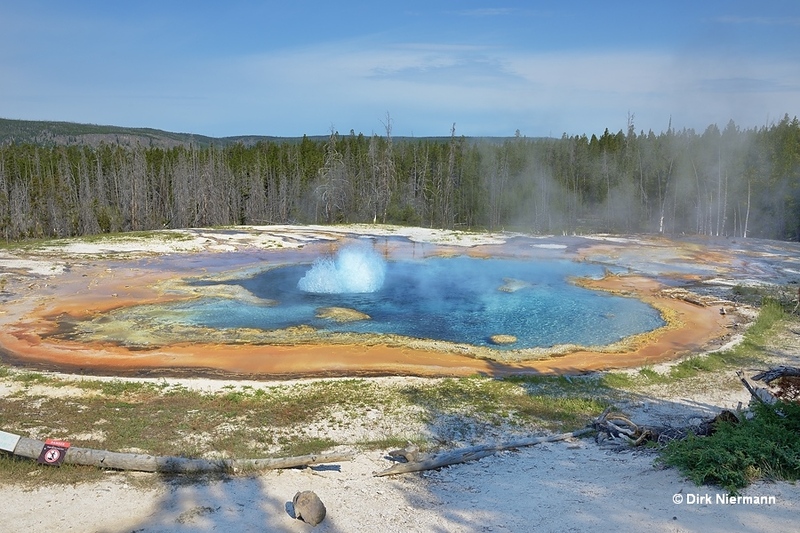 Aurum Geyser is another very impressive feature on Geyser Hill. The name refers to the golden stained geyserite bowl and the adjacent pool, looking like filled with golden coins. Up to eight times per day Aurum Geyser jets an 6 - 7 m (20 to 25 feet) high water column at an angle toward the boardwalk. 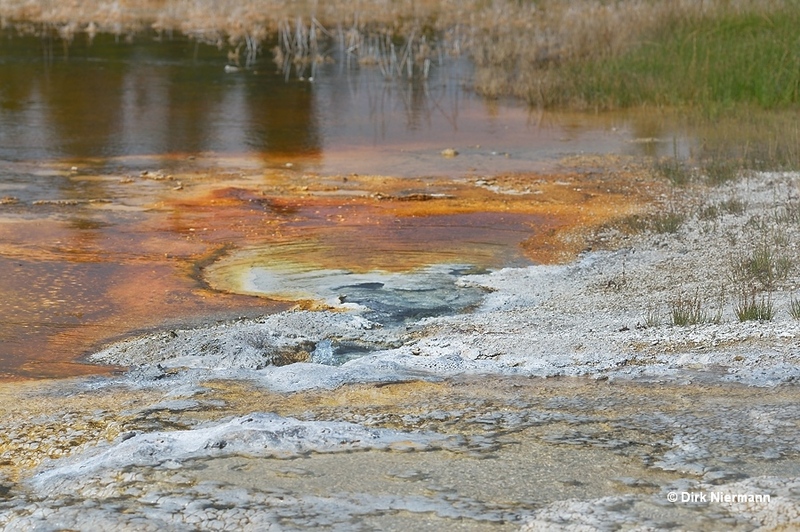 North of Doublet Pool and across from Aurum Geyser two unnamed features appear close to the boardwalk. Next, the boardwalk passes Beach Spring. The water in the bowl rises and falls within minutes. In overflow Beach acts as a bubble-shower spring. 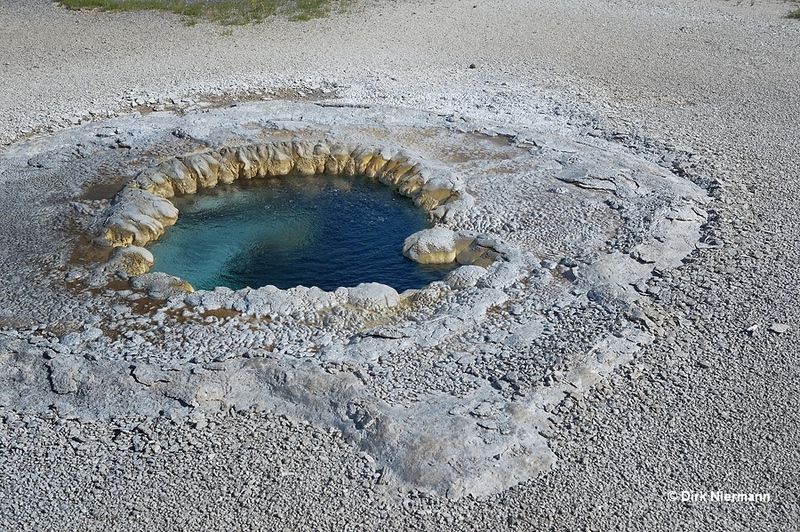 Beach Geyser is neighbored to Beach Spring. Simultaneously with UNNG-GHG-7 it is erupting frequently, but only some decimeters (one or two feet) high. Across from Beach Spring the trail to Solitary Geyser branches off to the north. Short behind the fork an unnamed, circular spring shows up. 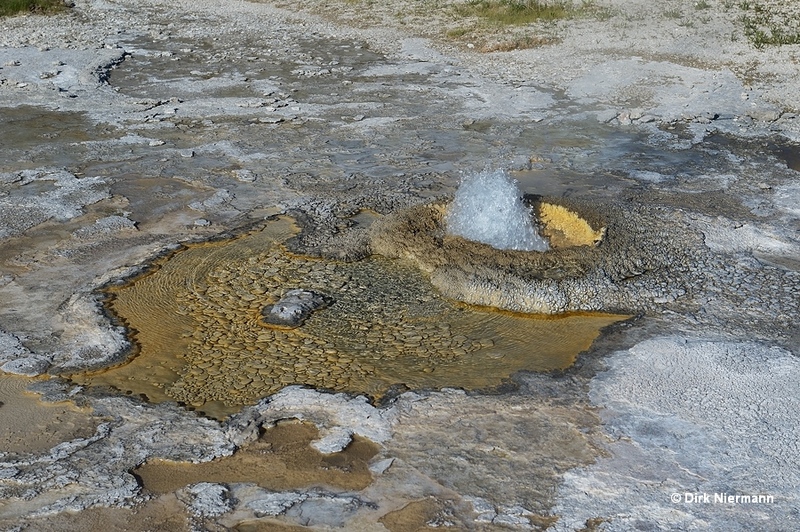 Solitary Geyser is well separated from the rest of Geyser Hill Group, hence the name. It erupts up to 6 m (20 feet) high approximately every five minutes. Back on Geyser Hill loop trail the naming of Exclamation Point, a quiet spring, doesn't need any further explanation. 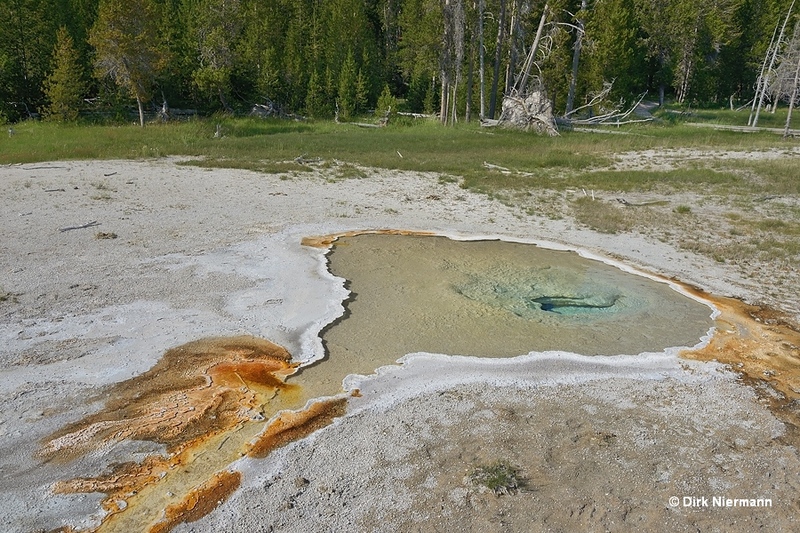 A short distance farther west Pendant Spring attracts attention, for which geyser activity before 1987 has been reported. 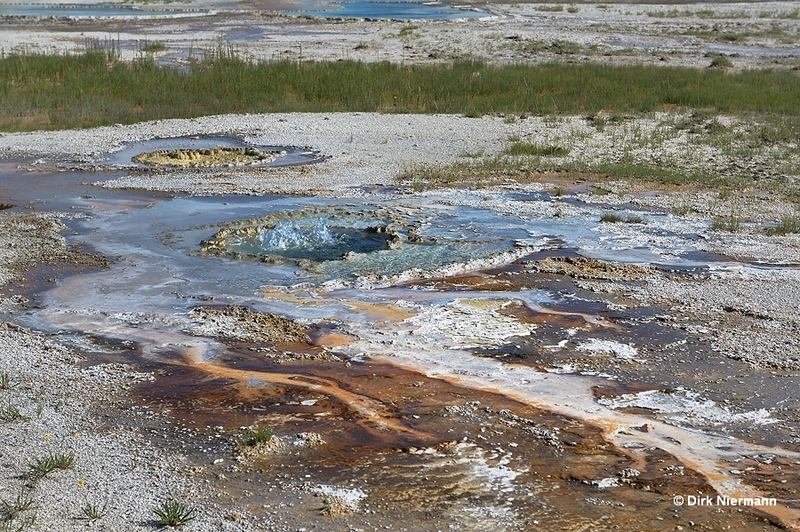 True geyser activity is very uncommon for the more or less constantly boiling Ear Spring, too. 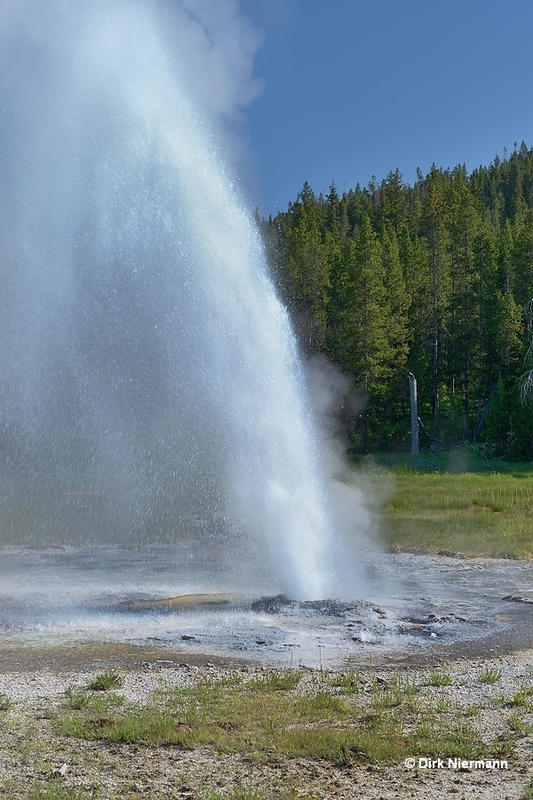 One of these rare events took place on September 15th, 2018, when Ear Spring erupted up to 9 m (30 feet) into the air. It was not only the first eruption since 2004, but its vigorousness also blew up a lot of debris from the springs clogged vent. This inluded cans, a part of a cinder block, dinnerware, 107 old and recent coins, and a baby pacifier from the 1930s. 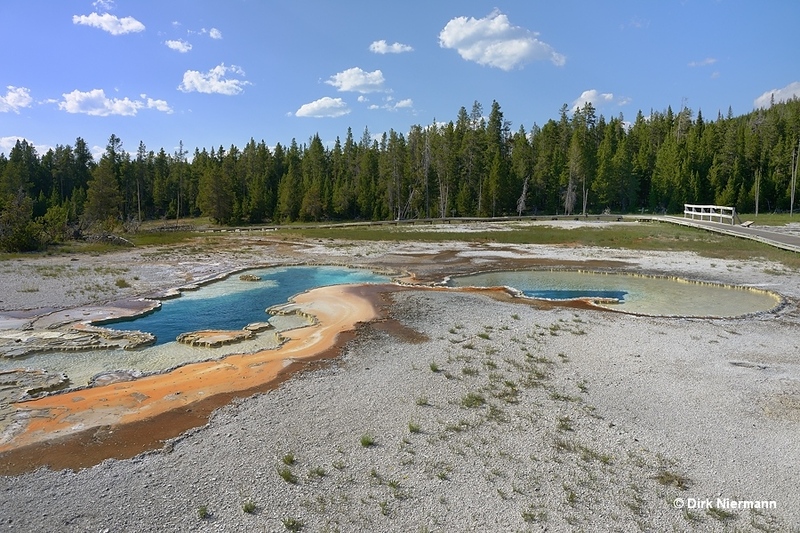 In this context the question arises of how much all other springs next to frequented boardwalks are affected due to accumulation of debris and how far this may change their natural eruption behavior.